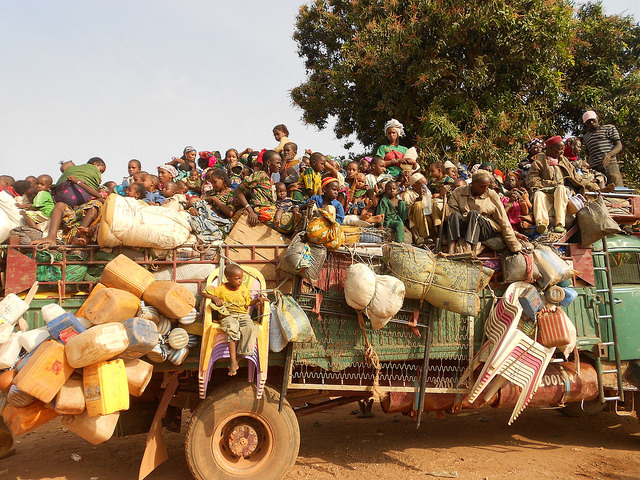 Caritas warns that refugees from the Central African Republic will suffer if aid isn’t increased this year. Mgsr Robert J Vitillo is head of Caritas Internationalis’ delegation to the United Nations in Geneva. He presented the aid agency perspective at the launch of the Inter-Agency Central African Republic Regional Refugee Response, sponsored by the UN refugee agency UNHCR in Geneva last week. The overall budget for the plan amounts to $331 million, but NGOs will receive US$14 million to support their respective programmes to help refugees from CAR. Msgr Vitillo said planning should take into account the care provided by NGOs. He said these organisations should receive an equitable share of funding made available by international donors. Nearly 190,000 people have fled the Central African Republic since the Anti-Balaka militia overran the capital Bangui in December 2013. Before that, more than 230,000 people already had fled, bringing the total number of refugees from the Central African Republic to some 425,000. Many are in Cameroon, Chad and the Democratic Republic of Congo. In these countries, Caritas has been providing training programmes for the refugees as well as education, agricultural supplies and equipment, clean water, sanitation and food assistance. Msgr. Vitillo also urged the international community to support to those who have fled their homes but remained within CAR. There the Catholic Church has been providing humanitarian help to displaced people in need through Caritas among others, but the complex environment makes this emergency work very difficult. “It’s vital to ensure adequate attention to needs of people in CAR, also with a view toward accompanying them as they struggle to achieve dignity and remain in their homeland,” said Msgr Vitillo.